Just because you don’t have an extra $10,000 lying around to buy a gold Apple Watch Edition doesn’t mean you can’t have one. One company has created a way to play your Apple Watch in 24k gold for just $97. The do-it-yourself kit, called the Midas Touch gold plating kit, works with Apple’s stainless steel version, and allows you to transform your Apple Watch into something that looks nearly identical to Apple’s $10,000 Apple Watch Edition for just a fraction of the cost. The kit adds gold plating to your Apple Watch using electrochemistry. You can check out a video of the process from start to finish here. For now, the kit only works with the steel version of the Apple Watch, however, its creator is working on creating a solution that works with the Apple Watch Sport as well. The project is seeking funding on Kickstarter, with an estimated ship date of July for the first kits, and August for the second run. Each kit includes enough of the solution to not only gold plate your Apple Watch, but also some jewelry or the Apple Watch or a friend. The Kickstarter isn’t the first option out there for making your Apple Watch gold. A company called WatchPlate 404 will gold plate your watch for you for $399. Sure, it’s a bit more expensive than Midas touch’s $97 kit, but if you’re wary of DIY projects then it could be an excellent solution. 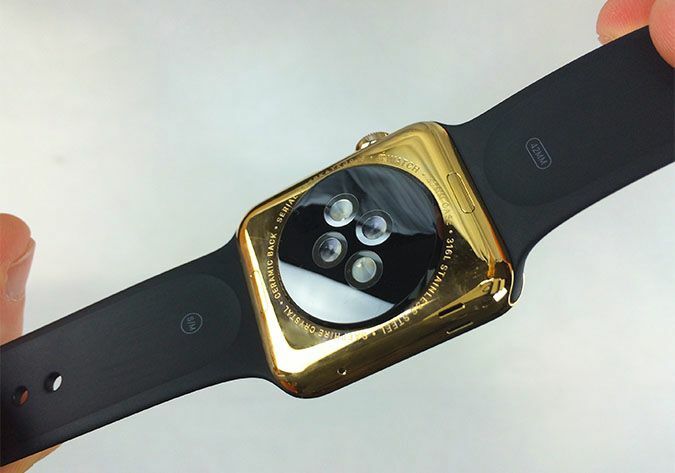 WatchPlate uses 18k gold instead of 24k, and you can choose between yellow or rose gold. Turnaround time is just four business days, so while you’ll have to part with your Apple Watch for a little bit, it’s not terribly long. Much like Midas Touch, WatchPlate is only able to play the steel version of the Watch, so Sport owners are out of luck. As an added bonus, that $399 fee also includes the plating of a watch band, so you can potentially end up with something even a little more high-end looking than the actual Apple Watch Edition. If you have an Apple Watch Sport, or just not a lot of extra cash, then you’re not entirely out of luck. One YouTuber, Casey Neistat, was able to transform his Apple Watch Sport into a fairly legit-looking gold Apple Watch with just a can of gold spray paint.